Hip hop is easily the most creative and most expressive subculture today. No other music since b-bop has provided artists the ability to explore an infinite number of sounds and themes. But, if your choice of �hip hop� is limited to Rick Ross, Nikki Minaj, 2 Chainz and Wiz Khalifa, you wouldn�t know that. This �pop hop� is extremely narrow in musical production and lyrical content and delivery. However, if you defy the corporate rap industry juggernaut and listen to true artistry and crave real emceeing, then you know that the music of hip hop is among the most important being produced in the world today. 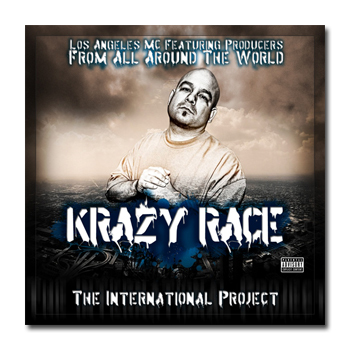 If you forgot or don�t know about the importance of hip hop worldwide, its true artistry or its potential to be the soundtrack to a global movement, then Krazy Race�s The International Project is here to remind you. And even more importantly, this music bangs. Krazy Race and guest emcees spit fire and deliver one heater after another. This cd is too important to miss. Everyone needs to pick it up. I especially encourage pop hop corporate rap stars to buy several copies and learn about true hip hop from the street. Krazy Race�s label, Realizm Rekords, dropped the 25-track compact disc (enough for a double cd or two-volume set) in late 2012 just in time to celebrate the coming of the Sixth Sun and the new world it promises to bring. The cd signals what might be coming in the next age as the veteran Los Angeles underground emcee teams up with an international cast of producers. The producers of The International Project come from 16 different countries including Spain, Japan, Latvia, Mexico, Slovakia, India, and Colombia. Krazy Race also teams up with a number of different emcees from across the country who deliver gems on their guest verses. A large number of producers, emcees, singers and/or guest musicians involved in a project often creates an incoherent product that is �all over the place� in terms of its sound, style and themes. However, Krazy Race�s strength as an emcee and executive producer who knows how to bring a project from start to finish holds this cd together. The tracks that he chose to rhyme to have commonalities that reflect the themes he examines in his lyrics. Krazy Race develops three main lyrical themes: aggression and bravado; relationships; and politics, power and resistance. He does this through great storytelling and extended metaphors. The compact disc is always serious with musical production that relies on eerie, synthesizer-heavy music over bass drums. --Track 6, �L.L.U.H.H.,� is another anthem song in which Krazy Race and guests Godilla and Lil Race pay homage to underground hip hop. Once again Krazy Race takes a stand as an independent/underground, non-corporate emcee. His hip hop comes organically from the streets of L.A. not from the offices of record executives. --�Gladiators� features a raw Spanish language verse from Abusivo. MCM from Slovakia sets the tone with the use of synthesized violin sounds. On this track Krazy Race details a battle in which he �bows down to no one.� It�s a track about triumph over difficult odds. -- French producer, XFA7 uses church bells, gongs, record scratches and high-whiny synthesizer melodies and sounds to develop a sense of urgency and excitement on the fast-paced, �Black Out.� The emcees including guests I-Suppose and Mesidge speak about battle and warfare. --�You Never Know� is a song of the arrival of death from many angles. It is supported by another mesmerizing piano melody; this time producer Wierdo from Italy is responsible for the great music. --The synthesized, operatic singing is a highlight of the song, �Chemtrails.� Krazy Race explains at the end of the song that the haunting singing is Mother Earth crying out due to the pain she is suffering from corporate and political greed. The song is about the mysterious white trails that we often see in our skies. These chemical trails are believed to be highly toxic. Krazy Race provides a number of important facts and ideas related to these chemtrails and other environmental problems including accusing the most powerful agricultural corporation in the world, Monsanto, of being a drug dealer. Audio clips of experts on chemtrails at the close of the song confirm Krazy Race�s analysis. --Krazy Race tells another great story on �Love Gone Wrong.� This time the story is about betrayal by a lover. A highlight is Nancy Ocampo�s beautifully sung chorus. --Children�s humming emphasizes the heartful nature of �From the Heart.� Krazy Race offers us a spiritual with this song of gratitude and prayer for a better world. Diamonique adds a layer of complexity to this introspective song. --Skinny Beats from Japan uses a rock guitar solo and dRumRap from All Else Fails rocks LIVE drums to form the unique musical foundation on �Master of Ceremonies � for Krazy Race to rhyme over. --Gremlin, Top Dime and Mexicali team up with Krazy Race to tell a great story of a gang of Western desperados on �Desperado.� Queen of the mic, Top Dime, spits a great multilingual, mostly spanglish verse. This song and �Guns, Bullets, and Kevlar� are as vivid examples of storytelling as the best action movies from Hollywood. And they bang! You will want to listen to this cd over and over again. There is so much going on from complex and unique musical production to great metaphors and stories that you will want to continuously �rewind� songs. The cd is not only enjoyable; it is important. This is the type of music true hip hop headz are looking for. It is only the independent and underground who are providing us with the musical sustenance that headz and hip hop require in order to survive. Associate Professor of Sociology at Chicago State University Author of Chicano Rap: Gender and Violence in the Postindustrial Barrio (University of Texas Press, 2008) & The [email protected] Hip Hop Nation: Politics of a New Millennial Mestizaje Coming Soon (Michigan State University, 2013).